Fort Collins Utilities maintains more than 11,000 streetlights and appreciates your help identifying those not working correctly. If you see a streetlight that is malfuntioning, tipped over, leaning, or with broken glass or exposed wires, call 970-221-6313. 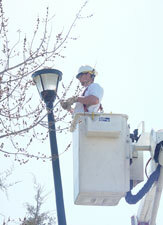 Streetlight outage notices also can be submitted through Access Fort Collins. Some lights have an ID number 6-7 feet up the pole, which is useful, if accessible. Your name and phone number are helpful in case we need additional information. If you are reporting a traffic light issue, please call Traffic Operations at 970-221-6630.